It is remarkable how much can happen while only walking. Or perhaps I should say the opposite. We spend so much our lives rushing about in a car driving from one important thing to the next. We hardly take the time to notice the details of our existence let alone our thoughts. 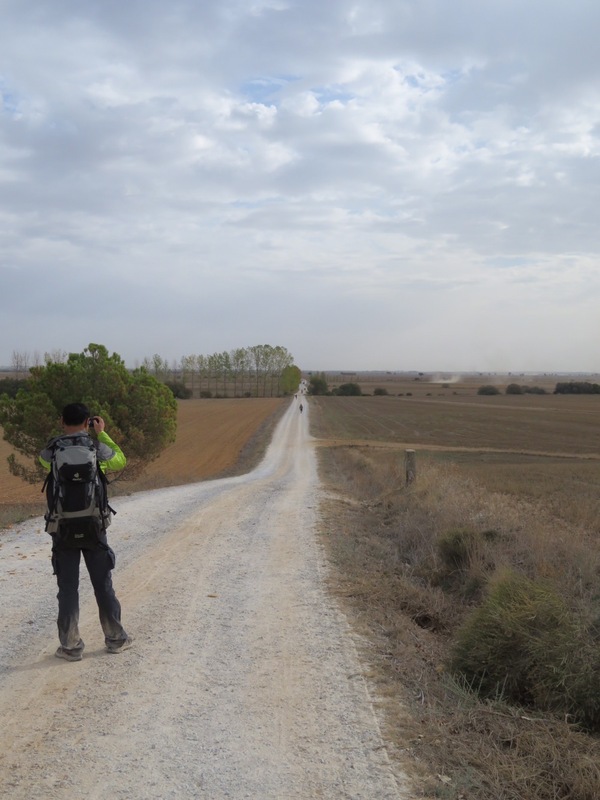 The Meseta offers the opportunity to explore ourselves and new perspective through which to view our relationship with others. I have found this a difficult portion of the journey. I am happy that I walked each step and happy to have it behind. In the morning I felt better but not too great and decided to head out. 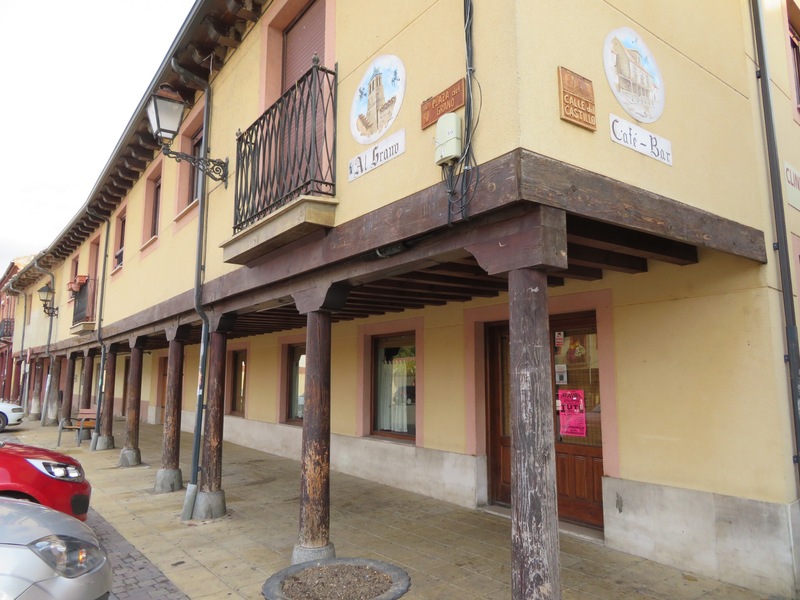 I had walked only 3k to the first albergue. It had a chair by the entrance so I decided to rest a minute. I realized I was exhausted. The place looked very inviting so I went to check in for the night at 9:30am. This was by far the nicest and best designed I’ve encountered. Looks very new with only 12 beds in six bunks of sorts. The top bunk is a walk up and each space is private with a nightlight and electric outlet. (Some places you will find a half dozen phones plugged into one. The sign advertised Reilke so I requested a session. It turns out that the local “healer” came for the session. Who would have known that 24 hours after being told I looked like a Shaman I would be seeing one! 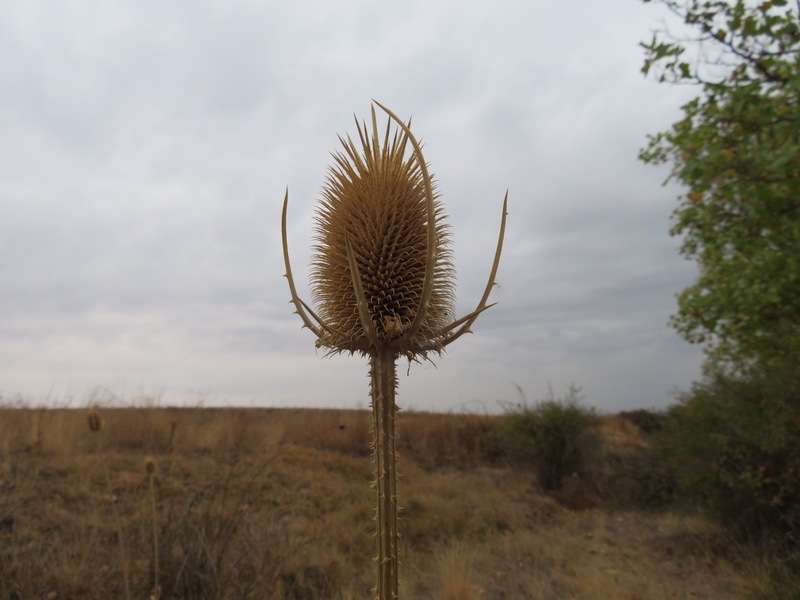 Interesting experience…. Basically I slept the better part of 24 hrs. I joined the evening meal for a test of food and to be socal but left soon to continue resting. Checked into my albergue and discovered that one of my dozen roommates is Timothy, the Irishman, who I met on month ago on the bus from the airport in Lourdes and last saw in Pamplona. 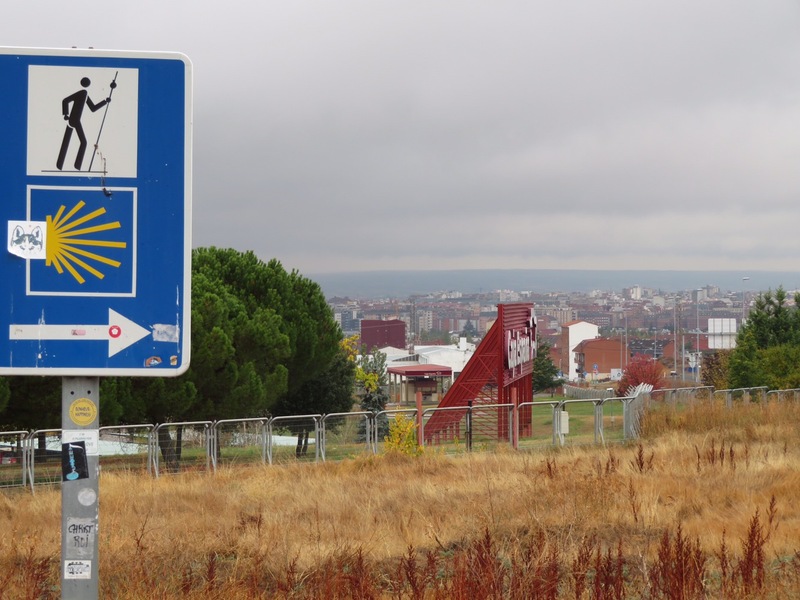 The Camino is like that. He was kind enough to share some of the dinner he cooked. 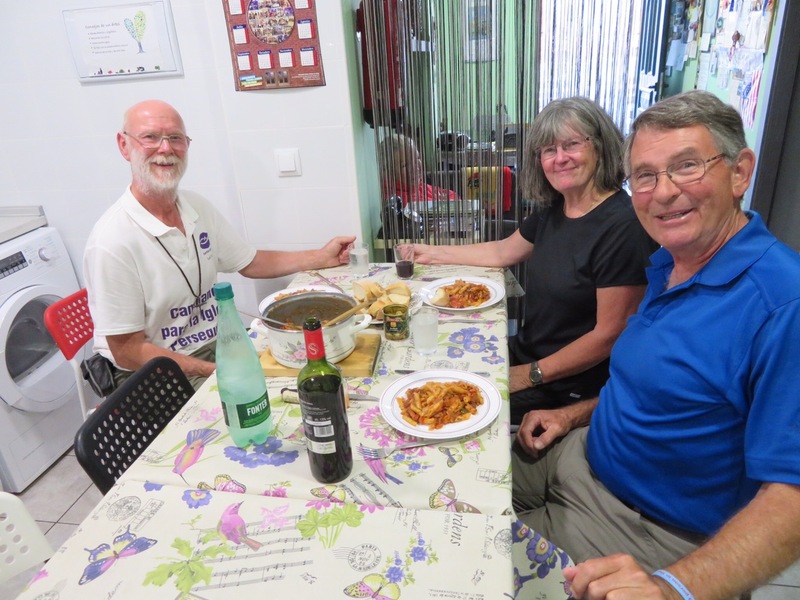 It was wonderful to have a meal which included fresh veggies and no french fries! It’s early Sunday morning walking alone on a very quiet country road there are many walking ahead and behind. Thinking about the people I’ve met so far and how they come into your life then vanish has led me to thinking abandonment issues related to my mothers suicide and my relationships in general. More lessons in acceptance. 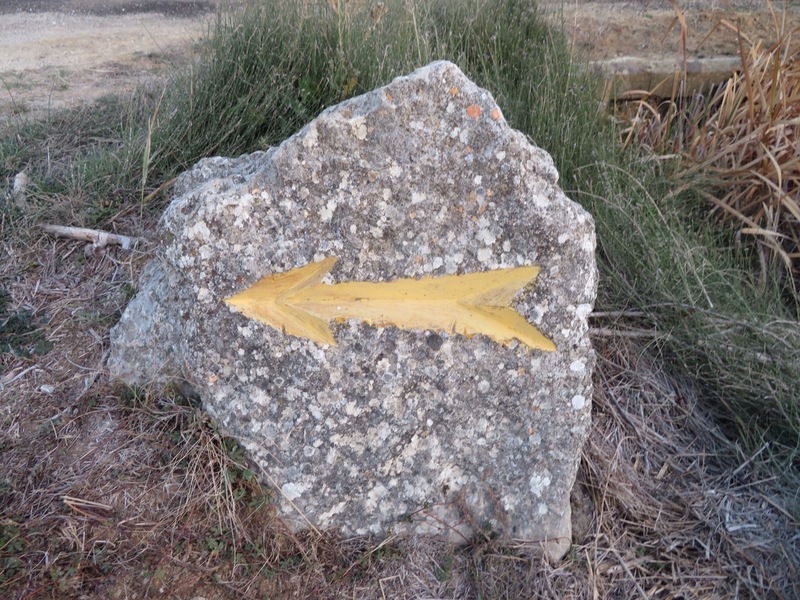 If one walks the Camino in order to finish it it may never begin, if walks it for the journey it may never end. 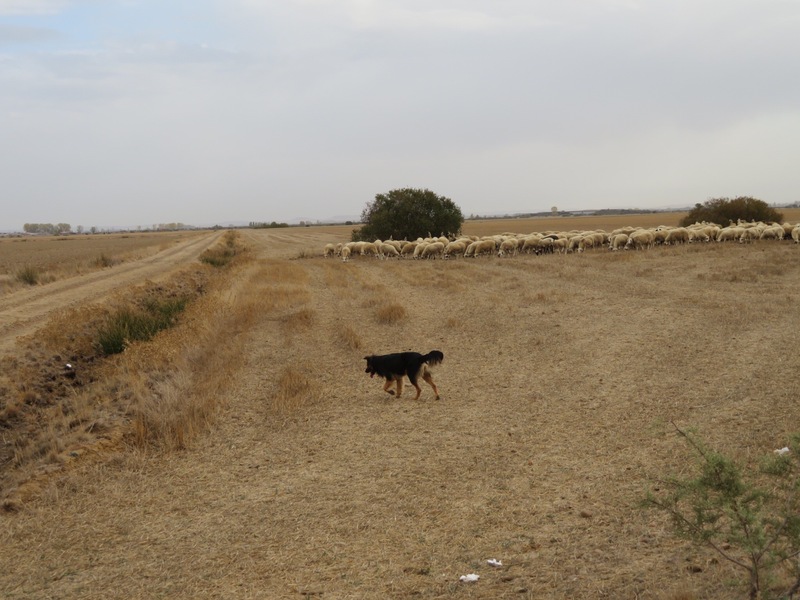 The next leg offered an alternate route away from the main road via a dirt road through beautiful empty fields. Here I met a gentleman walking in the opposite direction. 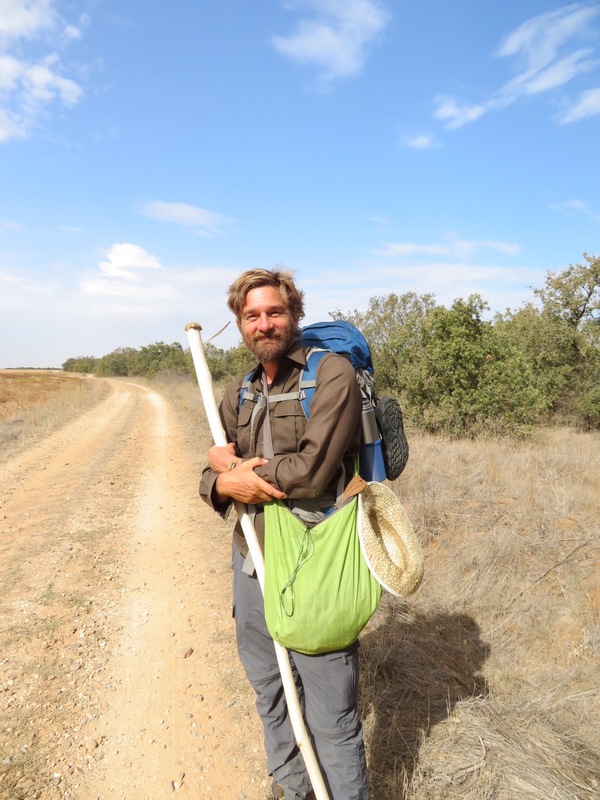 His name was Sky and he had begun walking the Camino from Chartres cathedral in France in 2009. He walked the famous labyrinth there to its center and proceeded directly on to Santiago. He has been traveling the world and feeling his life at loose ends. 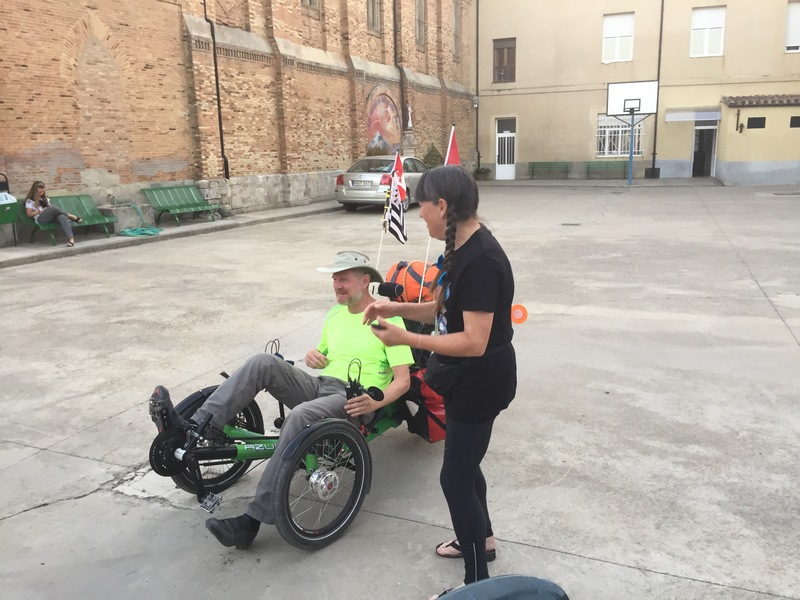 He has returned to walk from Santiago back to Chartres. This time he will complete the labyrinth by returning to the center and walking out. He said he will never again leave a labyrinth unfinished! Finally someone asked about my circle & triangle AA patch. It was good to have coffee and a two person meeting. An early start was in order for this walk of about 18 miles. With no challenges from terrain and the weather was not too hot which helped a lot. Great lamb dinner. I ordered Torta Santiago for desert which arrived accompanied by a shot glass containing a yellow liquor. Smelled pretty potent to say the least. Happy for yesterday mini meeting. Straight walk for 25 k without a left or right decision all day. Mule town was charming and a stopping place for Mariana as I spotted her cart parked on the street so I trust she was treated to a comfortable stable. I was invited to share a home cooked dinner with a man from Manchester UK and woman from Vancouver BC. 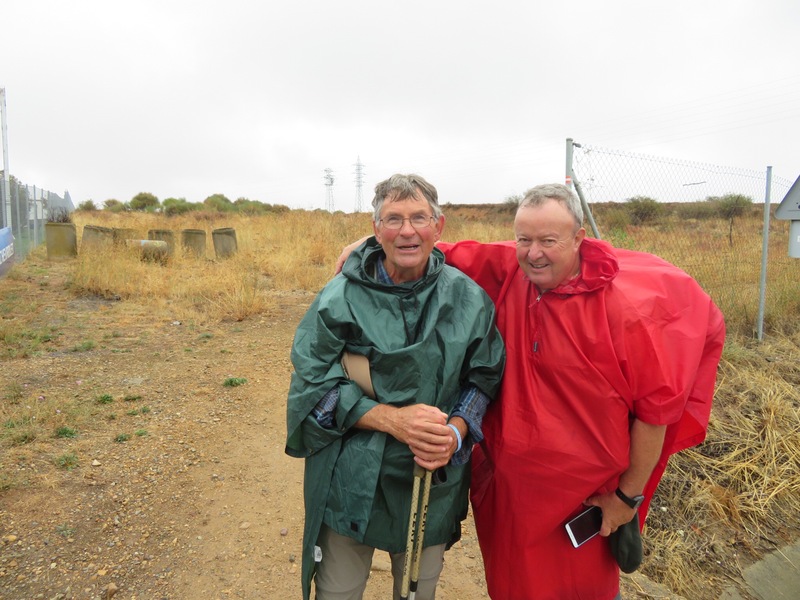 The Camino brings people together in so many ways. It is hard to know who is a couple and who justmet are are simply walking together. Another such couple joined our table as we finished dinner. He entertained us playing beautifully on a guitar that was available. So I was left alone to chat quietly with his companion. 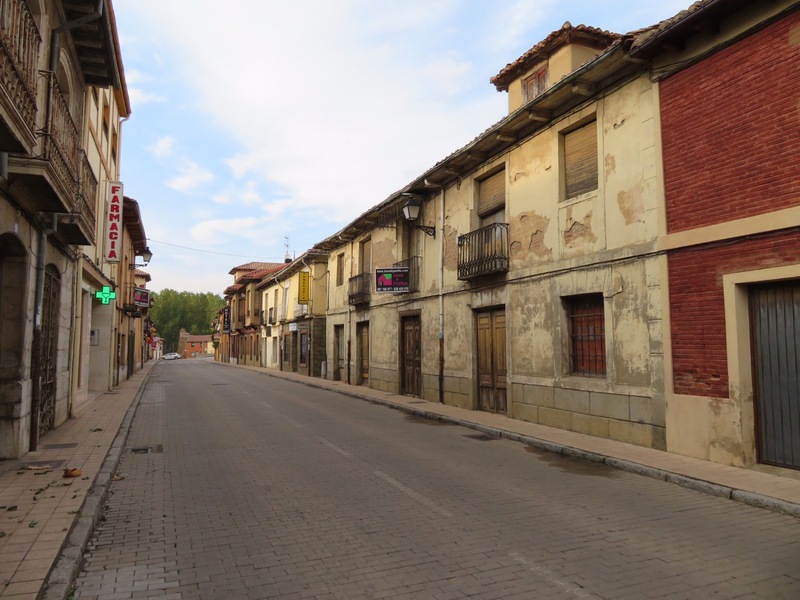 The conversations often begin with “what brought you to the Camino?” Her story was heartbreaking. She had seen the movie The Way and it had planted the seed. 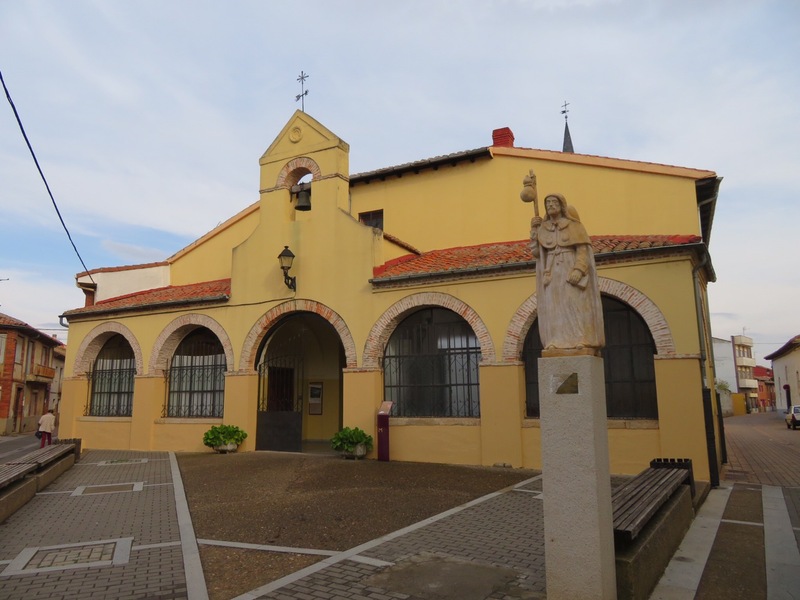 Last Christmas her daughter had given her a number of Camino gifts as encouragement for her to go. Last January her daughter died of suspicious causes. The woman is now walking the Camino to grieve and, like in the movie, carrying her daughters ashes. 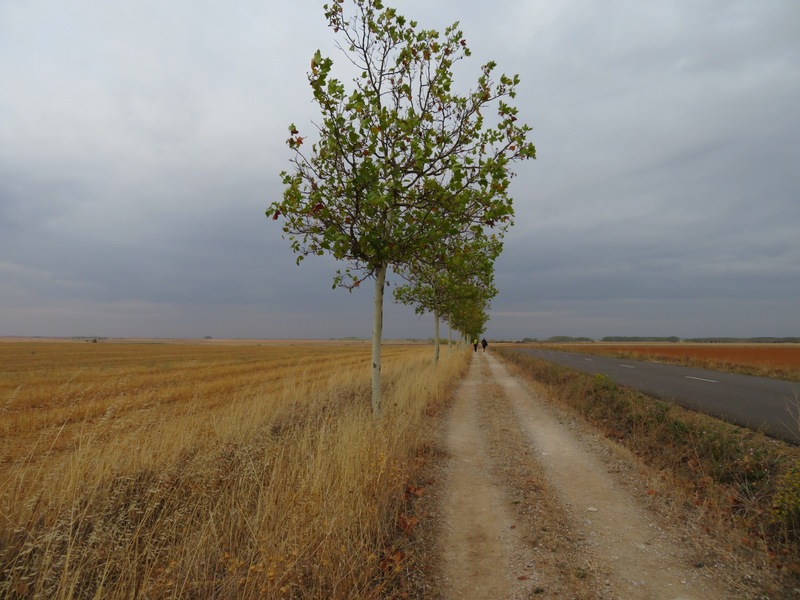 My thought for the day on this last stretch of the Meseta is -Show up for my life good or bad…. 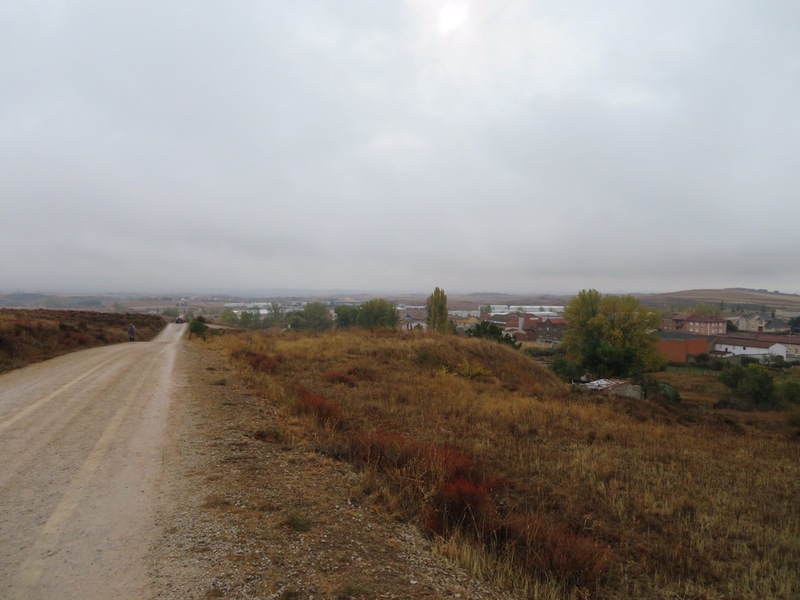 It was a cold wet morning walking through the urban suburbs approaching Leon. I walked a portion of the day with my Spaniard friend and guide Angel. 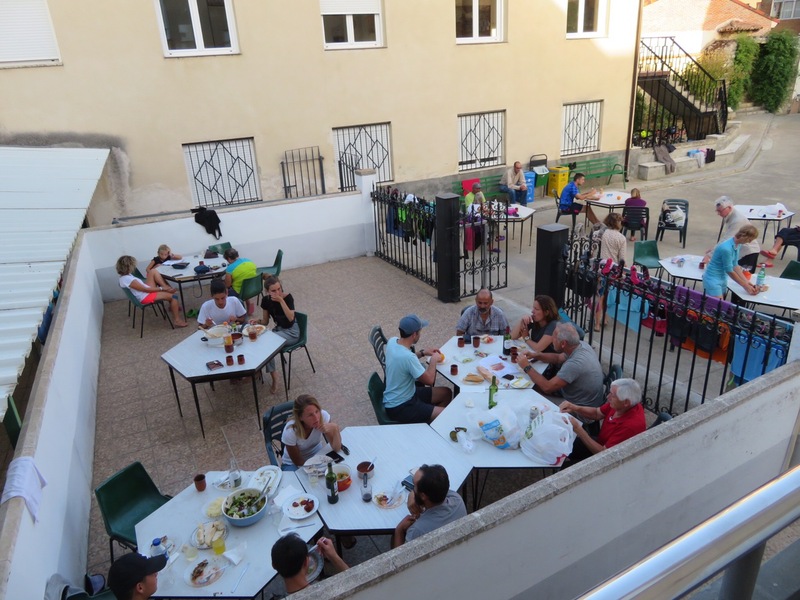 He has been wonderful offering advice on the best and cheapest places to stay. He seems to have taken me under is wing and we have enjoyed each other’s company even with the language barrier. He was good enough to give me his number before we parted in case I had any emergency and needed help. Bill, glad you still have the strength again to continue walking in spite of a physical set back . Dear Bill, very poignant thoughts. Some things I don’t remember knowing…I’m so happy for you for choosing this journey, in all meanings of the word. Blessings to you, dear friend. 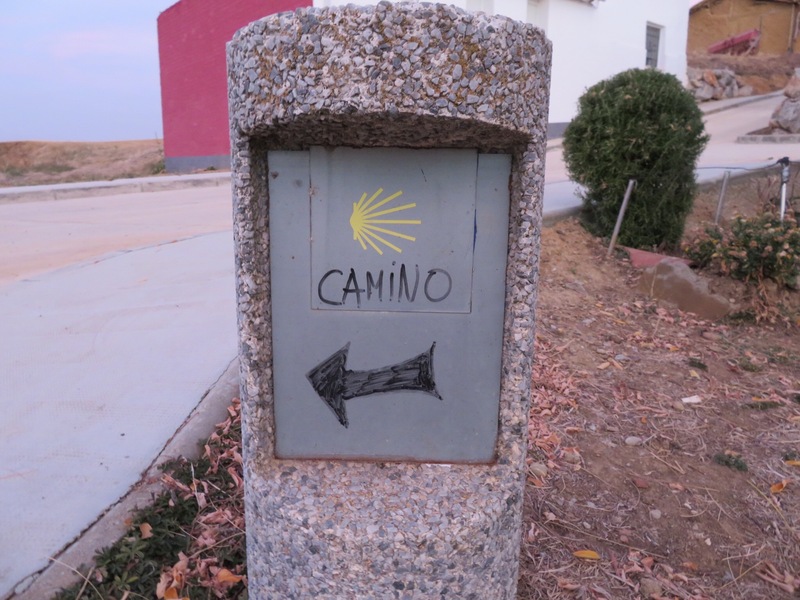 Bill, I am reading everything step and every word, enjoying your Camino! Love your pictures too. Thank you for sharing your journey with us. Bill, Thank you so much for sharing your journey. I have enjoyed every post. Amazing what a gift. Keep on trucking. The Canadian and I just spun an easy swirl from Guilford Green to the banks of the Branford. Who needs St. James or Leon when you have the Nutmeg Riviera? We think of you often, send a few prayers and marvel at your moving and beautiful blog. Enjoy Iberia. From the land of steady habits, we send our best.